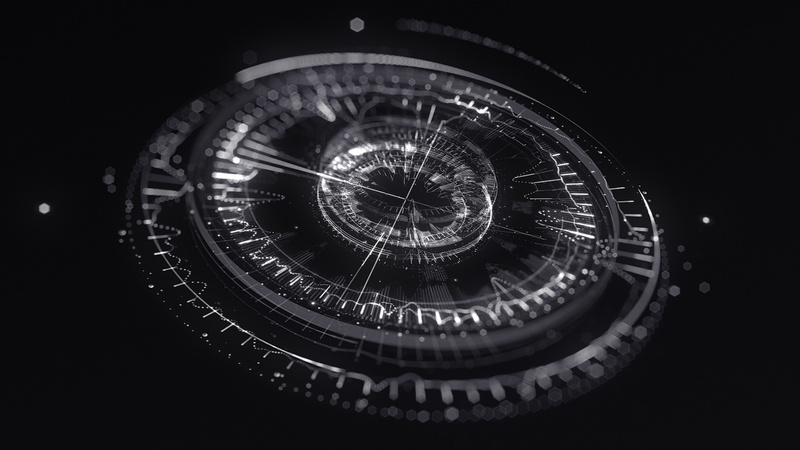 Today we have a special interview with Nicolas Lopardo, a very talented designer well known for his intricate FUI/UI/HUD designs and animations on Twitter and social media. I thought it would be a great idea to ask him where he gets his inspiration from, how these beautiful detailed graphics are created, and how he got into motion graphics. My name’s Nicolas Lopardo and I’m a Designer based out of Toronto Ontario, Canada. My introduction to this whole world of design and motion graphics came when I decided to go back to school at age 27 (I’m 31 now). I didn’t really know what I wanted to do, but I knew I wanted to be around television and film, so I decided on a 2 year program in Broadcast Television. A few months into the program we started looking at After Effects and 3ds Max. I was pretty much hooked after the first class. We didn’t go into very much depth, but I spent every subsequent night learning about visual effects and motion graphics on my own. I realized pretty quickly that if I could make cool looking stuff, I could maybe have a career in design. Since then I’ve had the chance to work fairly extensively in television. Every night I’d create something. Every day I’d reach out to places and see if they wanted to see what I had made. That’s pretty much the cycle that got me every job. I made a super plain amateur 9 second trailer that just resolved to my name, and I got a job as a designer for one of the national news programs here in Canada. I made some 3D space tube-looking things, and I got a job doing commercials for The Shopping Channel. I’m not saying all the stuff I made was bad, but it wasn’t much of anything, and it definitely wasn’t something you’d see on the news or in a shopping channel commercial. Slowly it just became apparent that if you make stuff you think is cool, people notice. I hated television. After having the chance to work in broadcast television graphics I realized that it just wasn’t for me. I tried, but it just wasn’t feeling inspiring in the least. I was so unbelievably happy to have job options, but at the same time I didn’t care. I wanted a career in design, but I just wasn’t feeling like this was worth it. Then, I watched Iron Man. What got you interested in FUI/UI/HUD style graphics? I always loved all that cool UI and HUD stuff, it just never crossed my mind that maybe I could make stuff in that direction instead. If I got a job at the news by making a trailer, maybe I could get a job in film by making UI that’s actually pertinent to the genre. And without saying too much, that’s the point in my career I’m just starting to get to as I write this. My main tools are C4D, After Effects and Illustrator. I love generative art, so I tend to explore a lot in C4D and After Effects. When I’m not exploring generative portions of an interface, I like to outline my ideas by sketching. My design process starts with reference. I try to collect just about anything that inspires the tone and feel that I’m aiming for. After that, I’ll sketch my plans out. Once I have a bit of a plan, I’ll start creating assets and building out everything. Another important approach is to just play. A regular part of my process is to just open a program and play around without any pressure to create a coherent piece. This is the phase where I learn and stumble upon techniques I’ll use in a more formulated piece. What is the easiest and hardest thing about designing these FUI/UI/HUD graphics? I’m so new to this whole FUI/UI/HUD stuff that I’m still fully just learning. I’m not sure what the hardest or easiest part of designing this stuff is, but I know I need to learn so much more by studying the greats. Do you have any tips for motion designers wanting to get into these types of designs? Where should they start? I think if you’re interested in getting into this type of design it’s important to just get inspired. For me, it started with things like Iron Man, and eventually became a little more ethereal. Everyone seems to say that you need to look to other sources besides FUI designers, but I think if you like this stuff the first thing you want to do is see who created the stuff you love, and how. For me it was looking at the work coming out of Cantina. Those guys really create some amazing stuff. What’s one thing you wished you knew before you got into this industry? One thing I wish I knew before I got into this industry is how much the process towards a goal can vary. Every project I work on has been an exercise in learning new ways to approach a design. The one thing that I spent way too much time on before getting into the industry was searching for the right way to do things. The right way doesn’t exist, and the cooler you make stuff, the less people tell you you’re doing it wrong. So, just focus on making stuff look cool and you’ll be just fine. For a piece like The Collective, I started with some generative elements composed of about 5 layers driven by audio and other time-based animations. Each layer has a purpose. One might be sparse dots. Another may be complex thin lines. One may be simple thick lines to give form. Once I established these designs I’d go on to shifting the layers in time to start to create some of the final frames. In this stage I like to accent the form with duplication and augmenting by adding extra structure. One method I used in this piece was to just use CC Cylinder to create some tube structures for form. Finally, I added the DOF with a Camera Lens Blur using pre-comped gradient ramps. In a lot of places the DOF doesn’t even make sense in terms of depth, and I don’t think it matters. It just ends up forcing a unique depth perspective when you see the extreme bokeh, and the bonus is it’s really fast and fixes the problem of elements like CC Cylinder not responding to true camera DOF. Hopefully this is useful to some of you out there! I’d love to share more like this in the future and it’d be great to hear what you think, so feel free to reach out and say hi over at liift.ca! And finally, I’d like to thank VinhSon and The CreativeDojo for making awesome tutorials! I think resources like The CreativeDojo are so essential to spreading knowledge and the reason that my learning was ever accelerated. When sharing knowledge affects a person’s ability to have a career it’s something really special, and I’d love to be able to contribute to that in some small way.